Who can apply for the Summer Workshop for Young Writers? Any high school student who will be entering 11th or 12th grade in the Fall of 2019 can apply for admission to the Summer Workshop for Young Writers. You may apply if you are not a U.S. citizen and/or if you are not living in the United States. However, only U.S. citizens are eligible for financial aid. How do I apply for the Summer Workshop for Young Writers? You must complete our online application form and submit a personal statement, writing sample, high school transcript, and teacher recommendation. Refer to our application page for details. The application for the 2019 Summer Workshop is due March 3 at 11:59PM Eastern Standard Time. You will receive an automated response by email when the application is submitted. If you do not receive this response, email help@interfolio.com or call (877) 997-8807. Can you accept a late application? No. We cannot accept late applications. How should my teacher submit my letter of recommendation? You will enter your teacher's email address under “Confidential Letter of Recommendation or Evaluation” on the “Required Documents” section of the Interfolio application. This will then trigger an email to the recommender that will include a link through which he/she can upload the application letter. How will I know that you received my letter of recommendation? You will be able to see if a recommendation letter was received via your own Interfolio account. While the contents of the letter will remain confidential, the system will indicate if a file was uploaded by the recommender. How do I make sure my teacher receives a request to upload a letter of recommendation? We encourage you to confirm with your recommender that an email from Interfolio was received. You will also receive an email confirming that you requested a recommendation. If there are any issues with this, contact help@interfolio.com or call (877) 997-8807. Any teacher or mentor who has taught you in an academic context, whether in school or in an extracurricular program can write your letter of recommendation. We strongly encourage you to ask a teacher who is knowledgeable about your passion for writing and literature to write your recommendation. You should upload an electronic version of your high school transcript to the Required Documents section of our Interfolio application. If I cannot submit my transcript via Interfolio, can I have my school send the transcript separately? While we prefer electronic files, if you are unable to submit the transcript online, you may send it to: Kelly Writers House, ATTN: Summer Workshop for Young Writers, 3805 Locust Walk, Philadelphia, PA 19104. Should I send an official or unofficial copy of my transcript? You may send either an official or unofficial copy of your transcript. What should I include in my 300-word essay? This essay is a chance for us to get to know who you are as a writer and thinker. Why do you want to spend 10 days in the middle of the summer writing? What will you bring to our community? Consider what we should know about you that isn't represented in other areas of your application. Be personal. What kind of writing should be in my writing sample? You should send 8 to 10 pages of writing that you feel best represents your ability and experience as a writer. If you have writing that is creative in nature – fiction, memoir, essay, poetry, etc. – that is best, but if your most polished writing is academic/critical in nature, you may send that as well. You may send excerpts from longer projects and/or multiple shorter pieces that add up to 8 to 10 pages as your sample, or one longer piece. How are participants chosen for the Summer Workshop for Young Writers? Participants for the Summer Workshop are chosen based on their potential as writers and their interest in being part of a student-centered, creative learning community. The strongest candidates are not necessarily those with the most experience, as we understand that not all passionate writers have been afforded the opportunity to study creative writing formally. We are looking for people who feel that they have a story to tell and who want to support their peers in their own literary endeavors. The best candidates will also demonstrate a strong work ethic and serious intellectual and creative ambition. Is the Summer Workshop for Young Writers selective? Yes. Given the intimate nature of the Summer Workshop, we expect that we will receive many more qualified applications than we have spaces available. We regret that we will not be able to accommodate every excellent writer who applies. Will participating in the Summer Workshop for Young Writers increase my chances of getting into Penn? There is no direct connection between acceptance to/participation in the Summer Workshop and Penn Admissions. We will offer an opportunity to visit the Office of Admissions for students interested in learning more about the University of Pennsylvania and we will keep in touch with participants who are considering applying to Penn. When and how will I find out if I've been accepted? Decisions will be sent by email by the end of March. If I am accepted, can I defer my spot until next summer? You may not defer your spot until next year. If you are unable to attend this year and are eligible for the program next year, you will need to reapply. If I am put on the waitlist, when will I know if a spot is available for me? We will let all waitlisted applicants know if a spot is available for them by the first week of June. If I am not accepted, can I apply next year? If you are currently a rising high school junior, you may apply again next year. If you are a rising senior, you may not apply next year, as you will be outside of our age range for eligibility. If I am not accepted, can you give me feedback about why? Unfortunately, due to the high volume of applications we receive, we are not able to give applicants individual feedback about why they were not accepted. If I participate in the Summer Workshop for Young Writers, will my chances of being admitted to Penn increase? Not necessarily. There is no direct connection between our program and Penn Admissions. That said, we at the Kelly Writers House will remain in touch with Summer Workshop participants who remain interested in applying to Penn. Additionally, we will provide an opportunity during the Summer Workshop for participants to attend an Admissions information session. Can I receive college or high school credit for participation in the Summer Workshop? No. This is not a credit-bearing program. How much does the Summer Workshop for Young Writers cost? The cost of the Summer Workshop for 2019 is $2750. The cost includes tuition, educational materials, housing, all meals, snacks, activities, and supplementary materials. What is not included in the cost of the program? We do not include travel costs and we recommend that students bring spending money for field trips and free time on Penn's campus (though spending money is not required). We have a limited amount of funding to cover some participants' travel costs. What happens if I have to cancel my enrollment? We urge students not to cancel enrollment unless there are truly extreme circumstances preventing their participation in the Summer Workshop. If a student must cancel enrollment before May 1, we can refund the student's deposit and additional payments. After May 1, we typically cannot refund deposits and other payments. Any participant who is a U.S. citizen can receive financial assistance. We will notify accepted applicants of any financial assistance in their acceptance emails sent the first week of April. Our financial assistance is reserved for those students who cannot afford the cost of the program. To apply for financial assistance, indicate that you need financial assistance on our application’s Academic & Personal Information form and include a brief description of your family’s financial circumstances, whether you are requesting a half- or full-tuition grant, and whether you are requesting funding for travel to/from Philadelphia. A limited amount of funding to cover the full cost of the program fee ($2750) or half the cost of the program fee ($1375) is available. Additionally, we have a limited amount of funding to assist with travel expenses for those receiving assistance for the full cost of the program fee. Will applying for financial assistance lower my chances of being admitted? No. All applications will be reviewed based on their intellectual and creative merit and potential. While we may not be able to provide financial assistance to all accepted applicants who apply for it, we will not deny any student admission to the program based on their need for financial assistance. Students will spend each morning in a personal essay writing workshop led by Penn creative writing instructor Jamie-Lee Josselyn, who also serves as the Director of the Summer Workshop. Over the course of the workshop, students will read and critique one another's writing as part of the revision process. Each day after lunch, craft sessions will be presented by guest lecturers in genres that may include poetry, fiction, screenwriting, experimental writing, comics writing, and more. Participants will also have the chance to get their hands inky at our Robinson Press, learn the basics of digital recording in our Wexler Studio, and take part in a collaboration with Penn's Institute of Contemporary Art. 10:15 AM-10:30 AM: Fruit Break! What if I don't want to focus on creative nonfiction writing? While morning sessions will focus on creative nonfiction writing, you will have the opportunity to explore many genres during the afternoon craft sessions. That said, if you are truly uninterested in creative nonfiction writing, this program may not be the best fit. Participants will receive written and oral feedback from workshop leaders and peers but will not receive grades. Will I receive college or high school credit for participation in the Summer Workshop? Morning sessions will be taught by Program Director and Penn creative writing instructor, Jamie-Lee Josselyn. 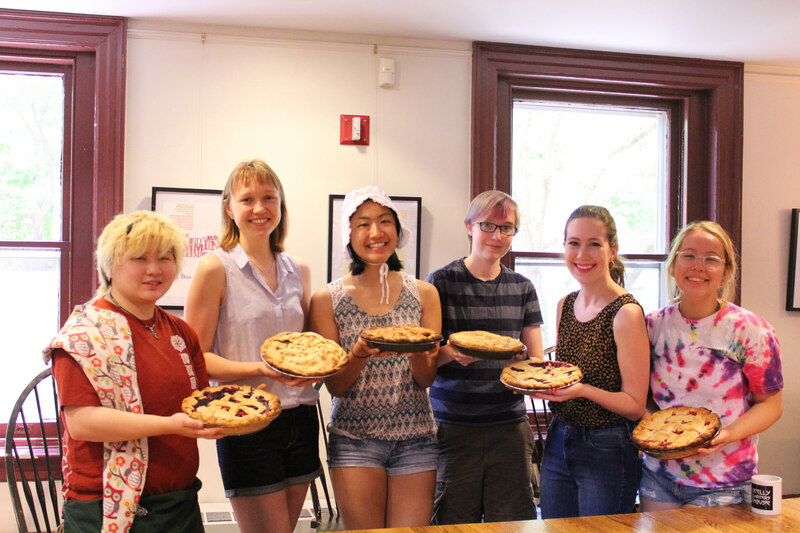 Afternoon craft sessions will be taught by visiting instructors who are affiliated with the Kelly Writers House and Penn's Creative Writing Program. What will the social life at the program be like? Participants will be strongly encouraged to socialize with one another. Participants will be housed in single-occupancy rooms in single-gender suites with a shared common space in one of Penn's College Houses. Two Resident Assistants will reside with the students and will assist in planning activities during the evenings. There will be a day-long field trip midway through the program. Students will also be permitted to explore Penn's campus when they do not have other obligations. At the start of the program, students will be informed of specific geographical boundaries for when they have free time as well as information about curfew and other policies. What will we do outside of workshop and craft sessions? There will be a number of social activities and field trips offered by program staff throughout the workshop, but participants will also be able to explore Penn's campus on their own and in small groups. Participants will also have writing and reading assignments which will take priority on some evenings. Where do students live during the Summer Workshop? Workshop participants will live in single-occupancy rooms in single-gender suites in one of Penn's College Houses. Specific information about the College House will be provided closer to the start of the program. I live in or near Philadelphia. Can I commute to the Summer Workshop? No. All participants must live in Penn student housing for the duration of the Summer Workshop. How safe is the College House and the campus? Access to Penn's College Houses is granted only to residents and to staff via Penn identification cards. Each College House is staffed by a security guard 24 hours a day, 7 days a week. At the start of the Summer Workshop, all participants will be given access cards and PINs in order to enter the College House for the duration of the program. Parents, guardians, and other guests must be signed in at the College House's Information Center. Penn takes the safety of its community seriously. The University of Pennsylvania Police Department is the largest private police department in Pennsylvania and maintains the second largest number of full-time sworn police officers amongst all private Universities in the U.S. There are a number of other measures that the Penn community takes to maintain a safe environment. More information is available on Penn's Safety & Security page. At the start of the program, participants will be given important phone numbers and will be provided other information about how to stay safe on campus. What are the policies on drugs, alcohol, and other forms of misbehavior? The Summer Workshop has a strict no tolerance policy when it comes to the use of drugs and alcohol. Any participant found in violation of this will be sent home at their own expense immediately. Other guidelines for behavior will be outlined in the Workshop Community Agreement which must be signed by the participant and their guardian before the start of the program. Any violation of these guidelines may result in a student being dismissed from the program and sent home at their guardian's expense, as decided by the Program Director. Can my family or friends visit me during the program? Unfortunately, no, with the exception of your parents or legal guardian(s) if it is absolutely necessary. Because the Summer Workshop lasts only 10 days, we do not want participants to be distracted from the curriculum and the community of the program. When we have free time, can I explore Penn and Philadelphia on my own? You will have specific geographic boundaries that outline where you can travel alone on campus. It is recommended that students travel in groups of two or more when possible. The Summer Workshop's residential staff will plan several outings beyond campus throughout the duration of the program and will be open to suggestions from program participants. Philadelphia is easily accessible by air, by train, and by car. Please refer to the Directions and Parking page for details. Additional information will be available to participants as the start of the program draws closer. How do I get to Penn from the airport or train station? Information is available via Penn’s Directions and Parking page. Additionally, for participants traveling to Philadelphia alone, the Summer Workshop will send a representative to meet participants at the train station and airport as needed. How do I get to the airport or train station from Penn? Summer Workshop staff will assist in coordinating transit options for participants traveling by air and by train according to participant departure times. The Summer Workshop will officially begin at 4:00 PM on Sunday, July 7. Participants can check into their College House any time between 11 AM and 4 PM to unpack and get settled. Participants are permitted to depart after breakfast on Wednesday, July 17. The Writers House will be open to participants throughout the day until 5 PM, but participants will need to move their belongings out of the College House the morning of Wednesday, July 17. There will be no accommodations provided for the night of July 17. Can I drive my own car to the program? No. Parking around Penn’s campus is very difficult (and costly!). We cannot permit participants to drive and park their own cars.